There really isn't one. You'll have to enter your name and email address for the deal. Olive Garden says you won't be opted into their email blast database if you do, though this raises the question: why collect the data? Nevertheless, it's a deal worth your digi-John Hancock. Coupon may only be used by the person whose name is printed on the coupon. 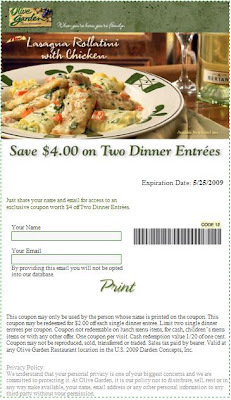 The coupon may be redeemed for $2.00 off each single dinner entrée with a limit of two single dinner entrees per coupon. We at Qmania love hearing about great deals and spreading the word on the truly buzzworthy. If you like this deal, let us know in the comments. Heard of a similarly rad deal? Let us know. Thanks and enjoy!